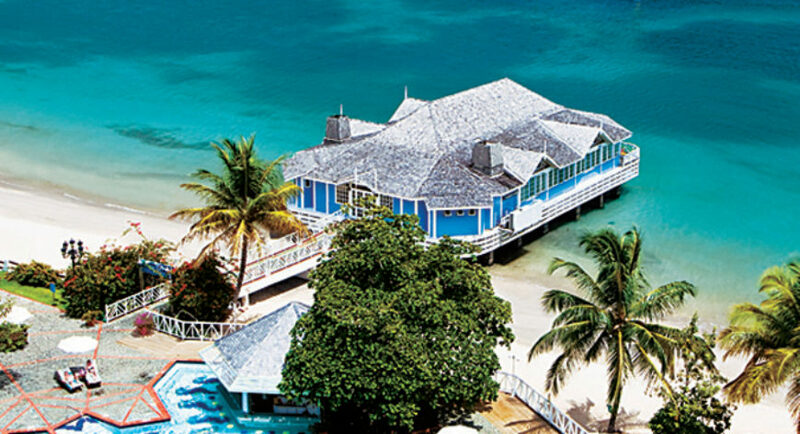 Sandals Halcyon Beach St. Lucia, the Ultimate Beach Resort, is made for lovers. 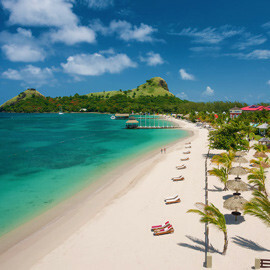 Hidden inside the naturally beautiful landscape of Saint Lucia lies a secret garden filled with effervescent flowers, luscious palms and serene waters, where couples come to escape and fall in love all over again. 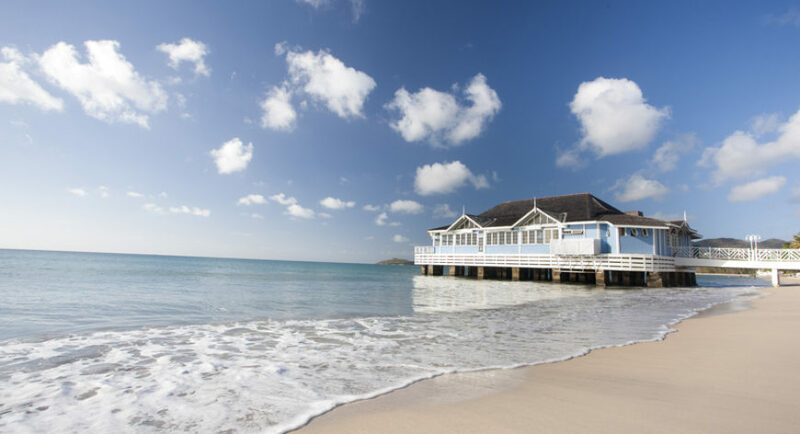 A true beachfront resort, with the excitement of the Caribbean and the quietness of a deserted island making it a ‘Home away from Home.’ The Resort stretches along 1039 feet of white sand beach. Rooms highlight true Caribbean architecture, all in 1 & 2 storey buildings amidst a kaleidoscope of colors from the secluded and lush gardens. 169 Rooms, Ten  Room Categories, Twenty-two (22) – acres, Air conditioning, amenity kit, hair dryer, telephone, ceiling fan, private bath and shower, iPod docking station, cable TV., coffee & tea maker, safe deposit box, iron, and ironing board. All Guest Rooms boast four poster beds, mahogany furnishing, and tiled floors. All bathrooms have bathtub/shower combinations. Serving a glorious repast on your terrace…just to name a few…a Sandals Room, complete with your own personal butler, is the ultimate indulgence. Enjoy beautiful vistas of the turquoise Caribbean Sea from the patio of this quaint cottage-style room, just steps from the white-sand beach. This newly renovated room features a mahogany four poster bed and island-inspired décor including a new bar unit, plasma flat screen TV and new furnishings. The bathrooms have a bathtub/shower combination. 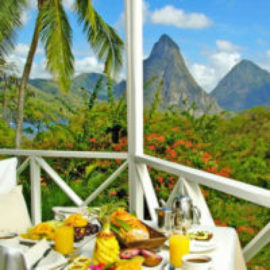 Marvel at an idyllic vision of the crystal-clear jade green waters of the Caribbean Sea, past the manicured lawns and vibrantly hued, exotic tropical blossoms from the charming patio of the supremely quaint, cottage-style room crafted from coral rock and overhung with cascades of purple and pink bougainvillea. A four-poster mahogany bed with flat screen T.V. and tasteful, island-inspired décor highlight the interior of this St. Lucian home away from home. The bathrooms have a bathtub/shower combination. Gaze out at the luminous rippling turquoise ocean from the patio of this ground floor Caribbean haven, nestled amongst wildly tumbling tropical blooms in every color of the rainbow and experience the wonders of its mahogany four-poster king-size bed, flat screen T.V. 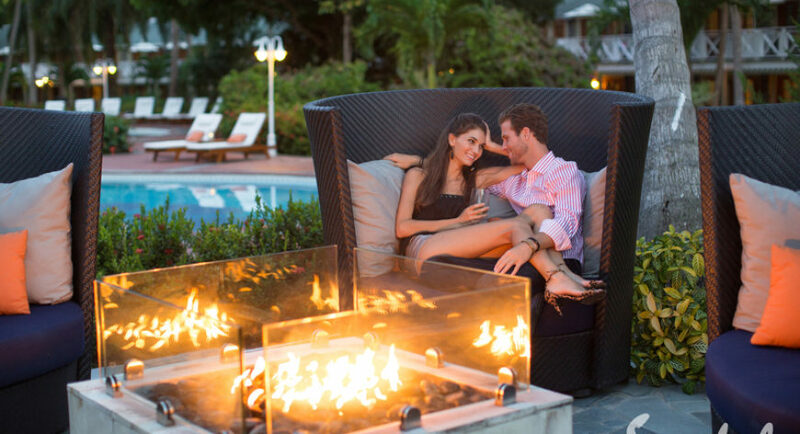 plush furnishings and marvelously authentic island allure. The bathrooms have a bathtub/shower combination. This serene hideaway features a newly refurbished oversized room with a large bathtub and new tile and bathroom fixtures. 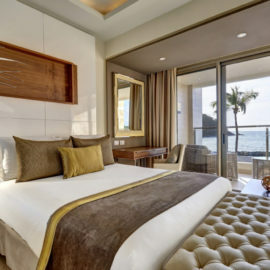 Room also boasts a flat screen TV and a four poster mahogany bed, in-room refrigerator and new artwork. The bathrooms have a bathtub/shower combination. All patios feature new furniture and umbrellas. 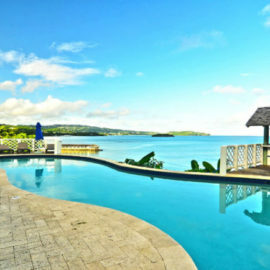 Tucked amidst the stunning landscaped grounds, this newly refurbished oversized room features a flat screen TV, four poster mahogany king size bed, large bathtub and new bathroom fixtures and cabinetry, Caribbean artwork and loveseat with ottoman in the bedroom. The bathrooms have a bath tub/shower combination. All rooms boast of balconies. Cradled in the lush embrace of gardens literally overflowing with multi-hued blossoms and the melody of birdsong, this delightful retreat features a mahogany, four poster king-size bed, and flat screen T.V. richly warm tropical-themed furnishings. The bathrooms have a bathtub/shower combination. All rooms in this category feature patios. Cradled in the lush embrace of gardens literally overflowing with multi-hued blossoms and the melody of birdsong, this delightful retreat features a mahogany, four poster king-size bed, flat screen T.V. richly warm tropical-themed furnishings. The bathrooms have a bath tub/shower combination. All rooms have a balcony. Tucked amidst the lush verdant greenery, this room boasts a king size, four poster bed, flat screen T.V. and tropical accentuated furnishings. The bathrooms have a bathtub/shower combination. All rooms have a patio. 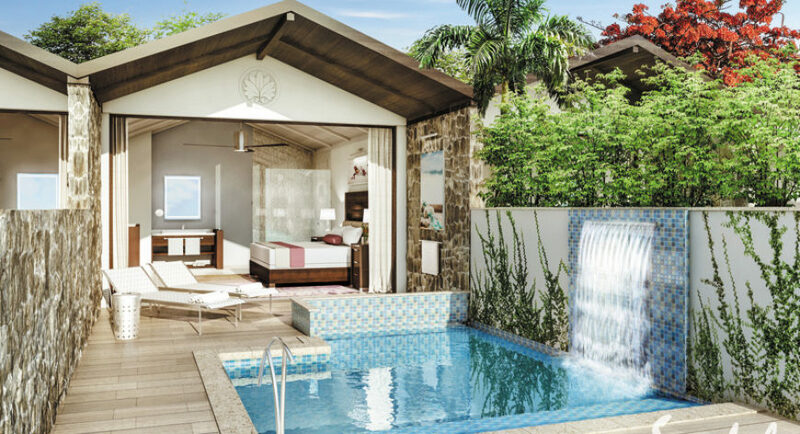 Survey the fragrant gardens and magical Sunset Pool as you while away countless hours on your patio or balcony which is draped with bougainvillea in brilliant shades of magenta, orange and lavender. 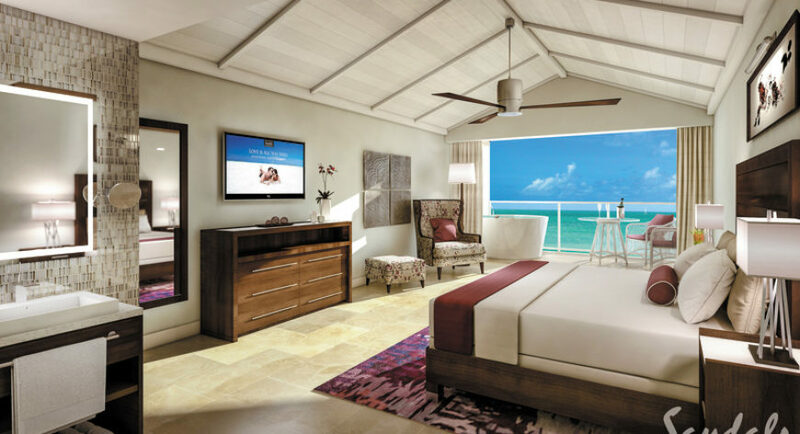 Enjoy heavenly comfort in this sublime room with its four-poster mahogany king size bed and flat screen T.V, its sensational St. Lucian-tinged décor and a splendidly genuine Caribbean appeal. The bathrooms have a bathtub/shower combination. 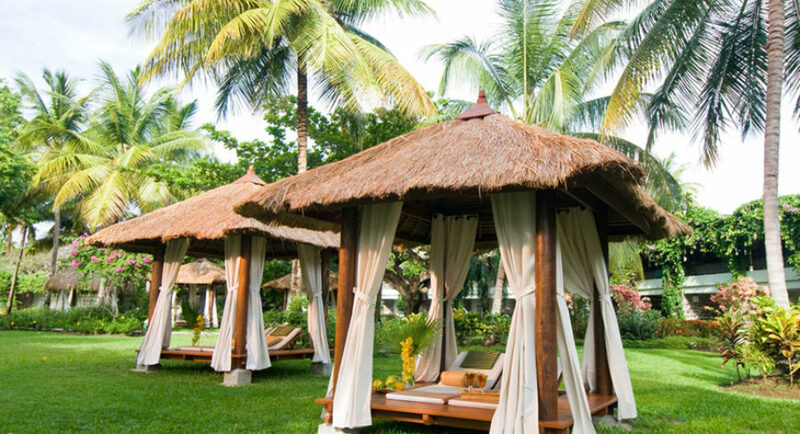 Tucked seamlessly amidst the towering palm trees, emerald plants and aromatic apricot, tangerine and scarlet flowers, this tranquil enthralling getaway enfolds you in its warm surroundings, which boast a supremely sumptuous king-size, four poster mahogany bed, flat screen T.V. tropical accentuated furnishings. All bathrooms have a bathtub/shower combination. All rooms have a patio. Follow the tantalizing aroma of exotic spices and perfectly grilled delights from skillful chefs who entertain with tricks while cooking on an iron, flat surface grill in front of their guests’ eyes. 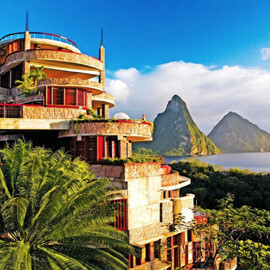 Resorts bring a taste of the Far East to the Caribbean. Named after Soy Sauce, a traditional ingredient in the art of Sushi, Soy offers exciting flavors and exotic sushi creations made to order. Exercise in a group! Rather than jump on a machine, get your workout by moving to the beat of your favorite songs. CERTIFIED and dedicated Fitness Professionals will lead you through a workout of a variety of movement combinations that exercise your muscles while you have fun in the sun at the same time. Our up-to-date classes are not intimidating and persons of ALL ages and fitness levels will enjoy our classes. Our Fitness facilities are fully air-conditioned and have state of the art equipment that is available 24/7. Our facility is also outfitted with our state of the art Life Fitness Equipment.